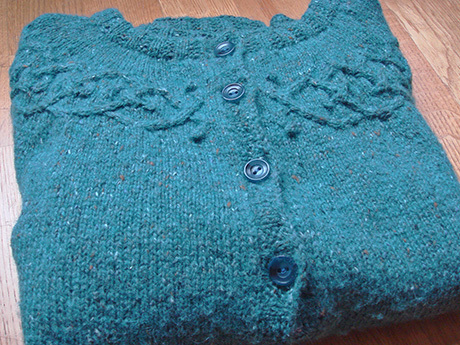 I finished the Tangled yoke cardigan before I got ill for the second time, and I even got the buttons bought. It then took me almost a week to get it all together and last weekend it was time for finishing party chez Yarn Nest. I have pushed forward the photo session, waiting for blue skies to turn up, but it looks hopeless. We do still have the same grey weather as we have had already too much of. So here it is, a modeled Tangled Yoke cardigan, picture taken inside. The fit of this cardigan is perfect. I freely admit I was a bit nervous before washing the cardigan for the first time, since I had measured the gauge after washing, and Felted Tweed is always growing in the wash for me. The sleeves of the unwashed cardigan ended halfway between my elbows and hands, and it was alarmingly short. But, all calculations were done right and the finished fit is just perfect. I have worn this cardigan for several days already, and it is absolutely one of the sweaters I’m most pleased with of all I have ever made. Pattern: Tangled Yoke Cardigan by Eunny Jang from IK Fall 2007. Yarn: Rowan Felted Tweed in colour 152 Watery (thank you Paulina for wise advises on choosing colour! ), 7 balls (didn’t use much of the seventh). Needles: 3,5 mm and 3 mm bamboo circular needles and 3,5 mm dpns. Eunny’s pattern is a very good one, as hers usually are. It was a joy to knit with Felted Tweed, and I didn’t mind the stockinette parts at all. 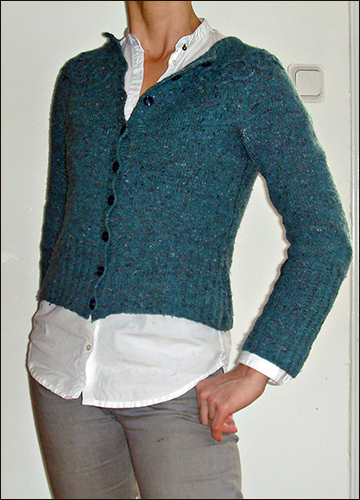 I used bamboo needles in size 3,5 mm for the body of the cardigan, and a cabling needle for the pattern. I usually cable without a cable needle, but the irregular stretches on this cable were easier to manage with a cable needle, I discovered. The button bands were knitted with 3 mm bamboo needles, and the button side reinforced with a cotton ribbon on the wrong side. The only change I made to the pattern was to start the short rows for the neckline a couple of centimeters earlier than what the pattern stated, in order to lower the neck opening somewhat. < ahref="http://reunasilmukka.net/">Kamicha did this on her Tangled Yoke last year, and I liked the way her cardigan looked a lot. If you like cardigans with a tight fit, then this is a pattern for you. The yoke construction is very good, and the cable looks far more difficult than what it in reality is. But if you are using Felted Tweed, take into consideration how the yarn behaves after a wet wash. There are several good looking but too big Tangled yokes out there in blog land. But besides that, I’m all for recommending this pattern, and I had no problems with knitting the cardigan. Okay, it’s no longer weekend, but the belated updated is due to having too much to do during the weekend, not to having got worse. In fact I’m quite all right, but my husband and younger daughter have caught the cold. Poor them. Yesterday I had the best vitamin shoot you can have: I went with Ludde for his first show training. There where five puppies and five adult Afghan hounds gathered, and it was great fun. 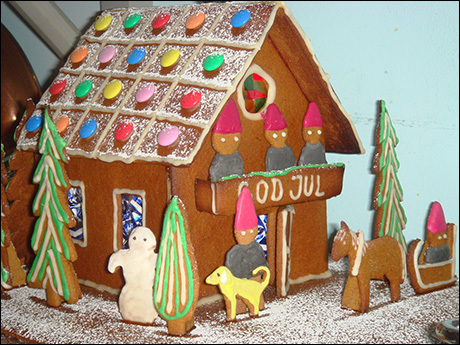 For those of you interested in Ludde pictures, there are pics from the trainings in Ludde’s blog. Someone said in the comments that knitting is good medicine for colds (thank you for all the lovely comments, they really cheared me up). Indeed it is, and especially stockinette knitting is good. Mindless knitting with a steady rhythm, and no thinking involved. My brains were not up to par during this cold, and when it took me two days to knit one and a half sleeve and the stockinette portion of the yoke of the Tangled Yoke Cardigan, it took me two more days to knit the cabled portion of the yoke. That is not many rows a day, considering that the cabled part is less than 20 rows high. Any way, I finished the yoke yesterday and picked up the stitches for the first button band in the morning today. 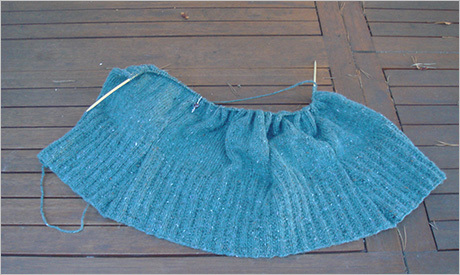 The fit of the cardi looks very promising, and I much look forward to finish it. I’ll visit Helsinki on Thursday, and I’ll look for buttons then. 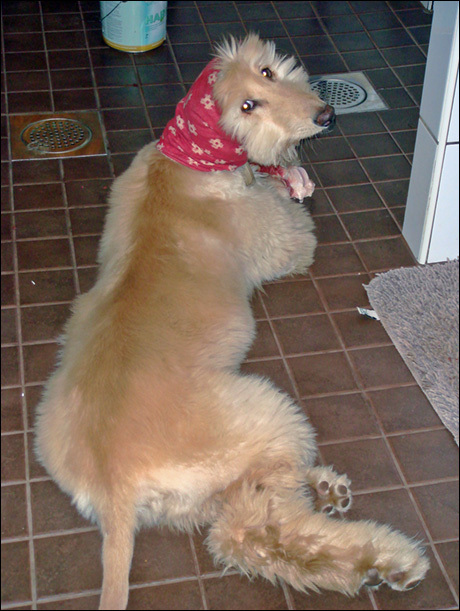 I have promised pictures of the mittens I years ago knitted from yarn made out of Afghan hound hairs. This yarn was one of the first I spun after learning to spin, and it is not a very even yarn. Nor is the carding of the Afghan hairs and the wool anything to brag about. But the mittens are very, very warm. The fairer part is knitted out 50% wool 50% dog hair, the darker only dog hair. I think the pattern is taken from Anna Zilboorg’s book Magnificent mittens, started from the tip and ended with the pompoms in the cuff. Click here for a detailed pictureof the cuff. The pictures are a bit dark, and I guess you have a hard time believing me when I say they were taken on Friday, at twelve o'clock daytime, outside. Yes, the weather is lousy again. I’ll be back tomorrow (I hope) with answers to Romi’s meme, and my candidates for the You make my day award I got from KaisaKaisa. Both need quite a lot of thinking about, and I think this entry is long enough as it is. So, how has the New Year begun for you all? Everything all right, I hope? Lots of laughter and joy? Good! The weather is cleaing up here. I read in the paper today that the Helsinki area had got 20 hours of sun in December. No wornder it felt like it was always grey and cloudy, eternal November weather, and never weather for taking pictures, neither inside nor outside! Today we’ve had sun and about 5 C degrees minus, refreshing, and oh so bright! A little bit of snow wouldn’t hurt, but this is all right too. I have had a pretty hectic schedule today, but managed to take a couple of pictures of the Tangled Yoke body before sundown. 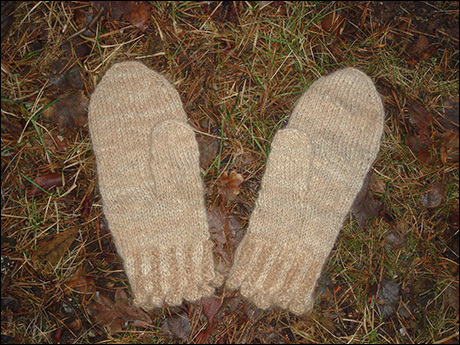 I haven’t forgotten the pictures of the finished Enpaper mitts, but had no time for them today. I have reached the increases in the body part; in fact I have made about half of them already. 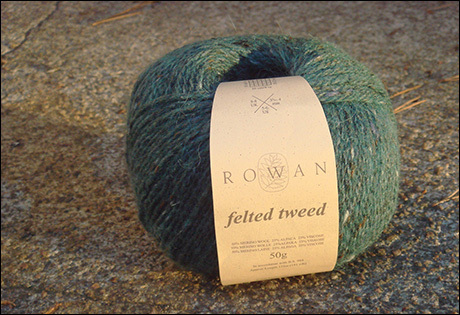 Rowan Felted Tweed is lovely, and the gauge is still right. I tend to go to loose with metallic needles and Felted tweed, and do nowadays always choose bamboos for that yarn. It’s a bit slow in the beginning, but you get used to the different rhythm pretty fast. 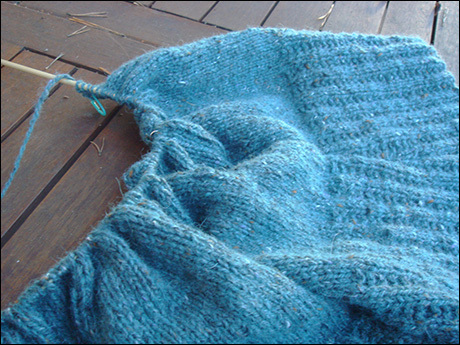 I’m very much in love with this project, and have interrupted my knitting only for working on Ludde’s web pages. This is the first time I’m doing all the coding myself, not working from a blog program and tweaking that premade setup. Quite exciting, I must admit! I’ll give the addy as soon as the pages are in better shape. 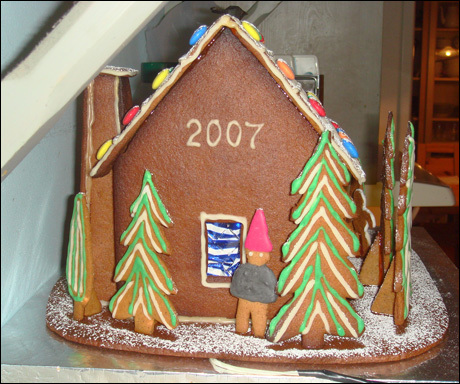 As for New Years promises, I haven’t made any, but I have a goal for this year: to knit all the designs Eunny Jang has made before 2008 (I’m sure she’ll publish more this year, but I’ll consider them as they appear). Eunny has so far eleven published designs, of which I have made/I’m making seven: finished are the Deep V Argyle vest, Venezia sweater, Anemoi mittens, Enpaper mitts, Bayerische socks, wips are Tangled Yoke Cardigan and PrintO’the Wave stole. What I have left are the Entrelac socks, Chucks cabled socks, Autumn Rose sweater and the Ivy League vest. Two stranded works, two pair of socks. I don’t have schedule for it yet, but this is the plan. 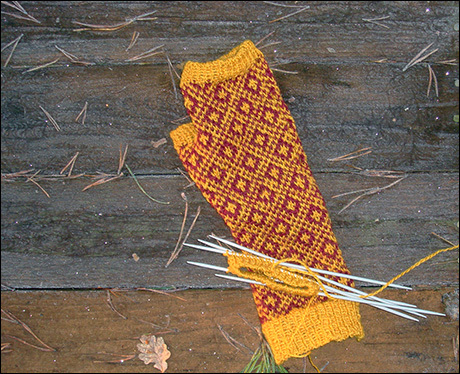 I hope to be back this weekend with pictures of the finished Endpaper mitts and a summary of my knitting projects 2007. Until then, be good, and knit a lot! 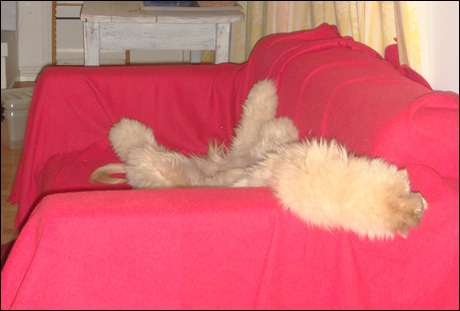 Ludde sleeping in the sofa. What you see closest to the camera is his left front paw, he's sleeping on his back. He hunted down a crow yesterday, and was very pleased with him self! And slept very good after that.